Today I am so honored to be a part of one of my favorite daily reads over at Simply Lulu Style. I am co-hosting with the gorgeous Lulu for What I'm Loving Fridays. Make sure you stop by her blog and say hello! I just love her fun style and all the beauty, fitness and life tips. Not to mention her kids are adorable… She is so down to earth and an amazing inspiration. Make sure you head over to Lulu and enter the giveaway today. OMG I am so in love with the item she has!!!!! I knew I wanted to wear a winter white dress the other day but had to figure out how to winterize it and without looking like I was headed to the lake. Although, with as cold as it has been here in California I wish I was heading to the lake. I paired my usual dark tights and put on a long sleeve shirt under the dress. 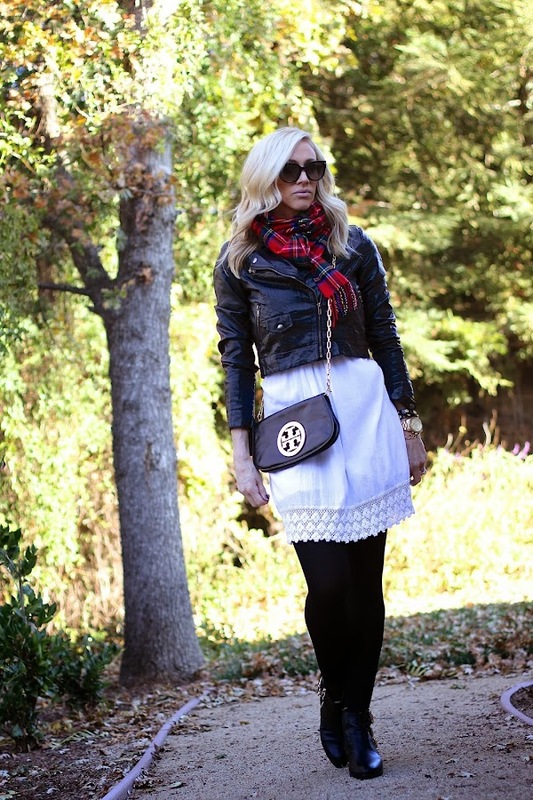 Added booties, a moto jacket and of course the plaid scarf. Boom! Winter white and I love it!! Are you wearing white this chilly season? Wishing you all a fab weekend… Any fun plans? Have a lovely weekend pretty girl! love the plaid scarf and jacket!! grt outfit!! Loving your use of plaid lately! I'm all for the white in winter. The only white piece I wore this winter was fluffy jumper from Primark, it's super warm and cozy.